The Tripitaka Koreana (lit. Goryeo Tripitaka) or Palman Daejanggyeong ("Eighty-Thousand Tripitaka") is a Korean collection of the Tripitaka (Buddhist scriptures, and the Sanskrit word for "three baskets") stored in Haeinsa, a Buddhist temple in South Gyeongsang province, in South Korea. It is a phenomenal example of the importance that Korean Buddhism places on the written word. Carved into wood blocks in an act of devotion to win divine protection for Korea during a time of war, the Tripitaka Koreana has won the well-deserved designation as a National treasures of South Korea. Although Buddhism emphasizes detachment from worldly cares and desires, the monks that preserved the "three baskets" of Buddhist teaching displayed knowledge of technology far surpassing that of their time. Buddhist scholars consider the Tripitaka Koreana the best preserved and most complete extant version of Buddhist canon in Chinese script. Carved onto 81,258 wooden double-sided printing blocks in the thirteenth century, the Tripitaka Koreana has no known copy errors. With 1511 titles in 6568 volumes comprising 52,382,960 characters, each wood block measures 70 centimeters in width and 24 centimeters in length. The thickness of the blocks range from 2.6 to 4 centimeters and each weighs about three to four kilograms. The Tripitaka Koreana, also known as the "Goryeo Tripitaka" the name "Goryeo," the name for Korea during the tenth century to the fourteenth centuries, served as source for the edition of the Taisho Shinshu Daizokyo. Korean Buddhist scholars first carved the Tripitaka Koreana beginning in 1011 during the reign of King Hun Chong when the Khitan invaded Goryeo during in the Third Goryeo-Khitan Wars. The King commissioned the carving of the woodblocks to evoke the protection of Buddha in the face the Khitan's invasion. Monks stored the Tripitaka plates in a temple near present day Taegu. During the Mongol invasions of Korea in 1231, the Mongols destroyed the original set of woodblocks. When capital Goryeo moved to Ganghwa Island during nearly three decades of Mongol attacks, King Gojong of Goryeo ordered the recarving of the Tripitaka. The carving took 16 years, from 1236 to 1251. At the beginning of the Yi Dynasty in 1398, the court moved the second copy to Haeinsa where they have remained housed in the Haeinsa library. The Tripitaka Koreana is the 32nd national treasure of Korea, and the Haeinsa Temple Janggyeong Panjeon, the depository for Tripitaka Koreana, has been designated as a UNESCO World Heritage Site as well as the 52nd national treasure of Korea. The UNESCO committee awarded Tripitaka Koreana World Heritage Site status, noting that the collection's completeness and excellent condition are unique. The committee also noted the aesthetic beauty and exceptional quality of workmanship. The Tripitaka Koreana constitutes the most complete and accurate extant collection of Buddhist treatises, laws, and scriptures. The compilers of the Korean version incorporated older Northern Song Chinese, Khitan, Goryeo versions and added content written by respected Korean monks. Scholars can get an idea of the older Chinese and Khitan versions of the Tripitaka from the Korean version today. Credit for the quality of the wood blocks goes to the National Preceptor Sugi who carefully checked the Korean version for errors. Because of the accuracy of the Tripitaka Koreana, the Japanese, Chinese, and Taiwanese versions of the Tripitaka are based on this Korean version. Carved out of birch wood from the southern islands of Korea, craftsman treated each block to prevent the decay of the wood. Artisans soaked the wood in sea water for three years before cutting blocks. After boiling the cut blocks in salt water, they placed them in shade followed by exposure to the wind for three years. At that point, the wood blocks finally reached the carving stage. After carving, the craftsmen covered the blocks in a poisonous lacquer to keep insects away and framed them with metal to prevent warping. Every block has 23 lines of text with 14 characters per line inscribed. Therefore, each block, counting both sides, contained a total of 644 characters. Calligraphy in the Chinese style of Ou-yang Hsun of the Song, a master calligrapher, graces the blocks. The use of Hsun's script enhanced the aesthetic value of the Tripitaka Koreana, which added to its historical and religious significance. The consistency of the calligraphy style suggests that a single man carved the entire collection but scholars now agree that a team of thirty men performed the work. Paik, Nac Choon (L. George Paik). 1951. 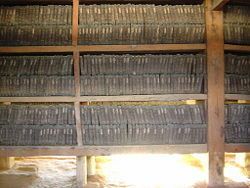 Tripitaka Koreana: Library of Woodblocks of Buddhist Classics at Haein As, Korea. Transactions of the Royal Asiatic Society, Korea Branch XXXII:62-78. This page was last modified on 17 December 2015, at 16:22.